Pneumofore presents the double-stage UV16 H B3500 IC VS11 vacuum pump. Specifically designed for drying applications, this vacuum system has the the capacity of 3500 m3/h, it can evacuate 78 kg of water per hour and achieve Dew Point of -35°C. It is composed by a Rotary Vane UV16 vacuum pump and a roots blower as second stage. Equipped with Variable Speed drive, the machine is completely air cooled in any environmental condition up to 55°C ambient temperature and it can be improved by remote controls and PLC systems. 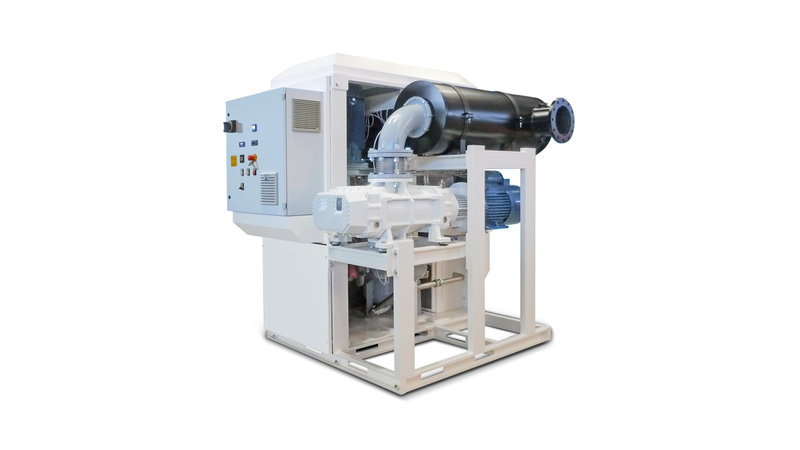 There are also larger models of double-stage UV vacuum pumps up to 10000 m3 per hour capacity with Dew Point of 0.03 torr. These machines are frequently used in pipeline drying and food processing applications.